For the people, Ugwuanyi is not just their governor, he is also their party. This situation has made the Ayogu Eze candidature very unattractive. I spent last weekend in Enugu. My actual destination was the University of Nigeria at Nsukka where Nkem, my son and first child, had just graduated from in flying colours. I was at his graduation ceremony last Friday in the company of friends and family members who had come to celebrate my 20-year old whiz kid. are approaching. I had earlier carried out a similar assignment in Lagos State. However, the Lagos report is yet to be released owing to the need to update certain information that were tenuous at the time the report was being put together. Back to Enugu State. My focus, this time, was on who will be the next governor of the state. In this inquiry, the name of the incumbent, Ifeanyi Ugwuanyi, naturally, popped up first. An array of gubernatorial hopefuls followed. But only one, Ayogu Eze of the All Progressives Congress (APC), was considered a major challenger to the incumbent. We were still putting the reports together when Fr. Ejike Mbaka, the fiery priest of the Adoration Ministry fame, carried out a strike that was almost preemptive. 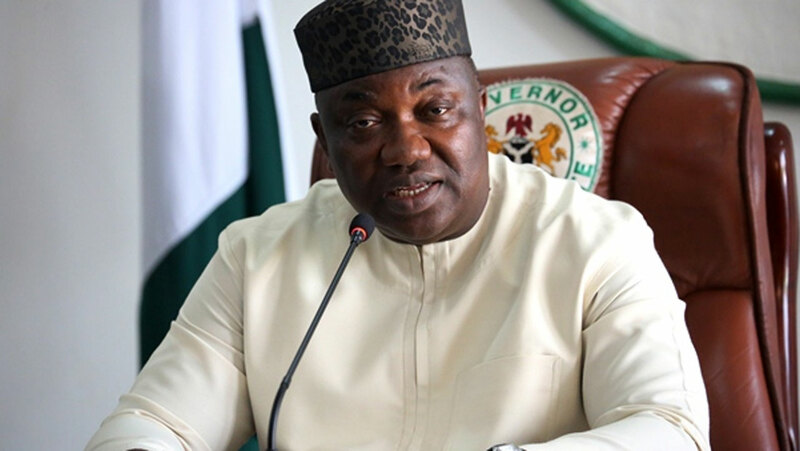 At a Thanksgiving Mass in Enugu celebrated for Ugwuanyi and other candidates to commence the campaigns for the 2019 elections, Mbaka declared an unequivocal support for Ugwuanyi. The cleric said of the governor: “He is a good man; a man of peace; a perfect genius; humble and ever patient.” I am not a fan of Fr. Mbaka and will not speak like him or borrow his words. As a matter of fact, I have had cause to object to some of his sacerdotal indulgences in the past. However, the sentiments he expressed about Ugwuanyi have some synchrony with our discoveries. They capture aspects of what we have come to see or know about the governor and his politics. Anybody who has paid the slightest attention to our politics will readily acknowledge the fact that peace is the scarcest commodity in the political arena. Politics in Nigeria is anything but peaceful. It is a dog-eat-dog situation. It is a game in which most of its players believe that they must trample upon others in order to find or stay relevant. It is a game in which people shun the idea of playing by the rules. I remember being mocked by a frontline and highly revered Nigerian politician for bringing morality to bear in our political discussion. He pitied what appeared to him to be my naivety. He believes that morality has no place in politics. For him and his ilk, the acceptable approach is to indulge in a Hobbesian struggle where only the fittest survive. That is why a simple survey of the states of the federation reveals a troubled political landscape where peace has taken flight. But anybody who has come close to Enugu state since the emergence of Ugwuanyi as governor will effortlessly admit the fact that Enugu spells peace. In the state, nobody is discriminated against on account of political affiliation. No part of the state is victimized or neglected on account of political loyalty. The governor assumes the fatherly role. He has shepherded everybody into a harmonious flock. Unlike what obtained in the past in the state when godsons took on their godfathers, such acrimonious struggles have seized. The governor sees no need for rancour. And so, he has embraced one and all. And Enugu state is the better for it. Our inquiry exposed this state of affairs copiously. When therefore the question came up as to who the next governor of Enugu state would be, an overwhelming majority of the interlocutors easily settled for Ugwuanyi. As we noted earlier, the governor’s most formidable rival is Senator Ayogu Eze of the APC. However, Eze came nowhere close to Ugwuanyi for a number of reasons. One is that the people are not prepared to trade off the peace they enjoy under Ugwuanyi for anything. They do not want to return to Egypt. They do not want to be reminded of the acrimonious years when Jim Nwobodo locked horns with Chimaroke Nnamani. They do not want a reenactment of the cold war that reigned supreme between Sullivan Chime and his predecessor. The people do not want a clash of the big powers and their vested interests. They are convinced that it is only an Ugwuanyi governorship that can guarantee them that. With the fusion of forces that used to be at each other’s throat, Enugu, under the Ugwuanyi order, has become a one-party state. The Peoples Democratic Party (PDP) under whose platform Ugwuanyi rode to power, has become the preferred party in the state. It is therefore remote to imagine what another party can offer. The people do not seem prepared to contemplate an alternative. They do not see any need for it. For the people therefore, Ugwuanyi is not just their governor, he is also their party. This situation has made the Ayogu Eze candidature very unattractive. The people are not attracted to his story. They do not seem to be interested in whatever he may be offering. They see his ambition to topple the incumbent as a tall order; a huge joke with temporary entertainment value. For the greater majority of the people of Enugu state, Ugwuanyi is not playing politics. He is just being natural. He is, by his very nature, a man of peace. He has no airs around him. He is just a humble servant of the people. During one of my recent visits to Enugu, I rode on a chartered vehicle to one of the border towns of the state. I chatted freely with the cab operator as we journeyed along. Moments after we left the Anambra border and veered into Oji River local government area of Enugu state, the man changed the topic. His remark was that the governor of Enugu state was wise. I asked him why he said so. He told me that the governor knows how to maintain roads; that he patches potholes on the roads once they are noticed and thereby cutting costs that would arise from full blown road maintenance or reconstruction. This, he said, contrasted sharply with the approach of the Anambra state governor whom he said has the habit of allowing roads to collapse completely before rehabilitating them, thereby spending a lot more money in the process. When I reminded him that Anambra and Enugu states boast of better roads than Imo and Abia states, he had a good laugh. He said the cases of Imo and Abia were better forgotten. In fact, I had more than a mouthful. The verdict from the quarters that we encountered was reassuring. Enugu state will go into election in peace and have their governor returned to office with an overwhelming majority of the people voting for him. There is no tension in the state because the governor is not facing any serious challenge. The governor may be a politician, but he is running the affairs of the state not with the disposition of a politician but with the sagacity of a statesman and patriot who places service to the people above narrow, selfish considerations.